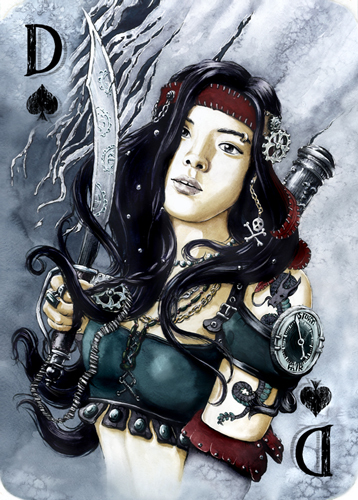 Grim Dream Art: Steampunk Playing Cards part 3. 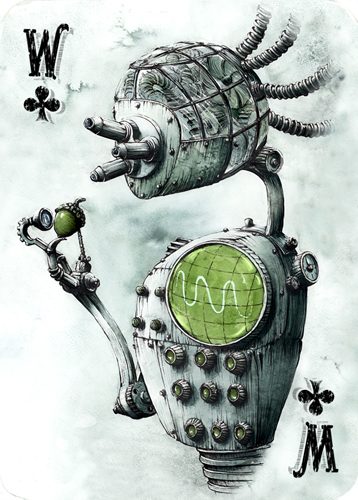 Ready for the third (and yet the last) post about "Steampunk Plaing Cards" made for a Polish playing card company "TREFL"? It took me about two months to prepare the whole deck, so regardless your answer let me present clubs and spades! Just in case you missed the previous two parts of presentation, here they are: part1 and part2. Clubs were meant to refer to technological and scientific aspects of Steampunk. 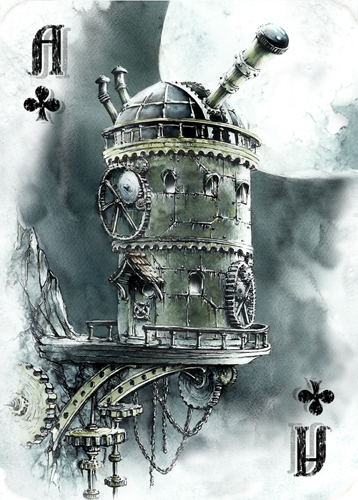 Strange, exaggerated glasses and lences are such a typical feature of Steampunk styliscs, that I couldn't resist choosing observatory for a building representing the ace of clubs. According to my own guidelines jacks should be robots, which are technological achievements itself. 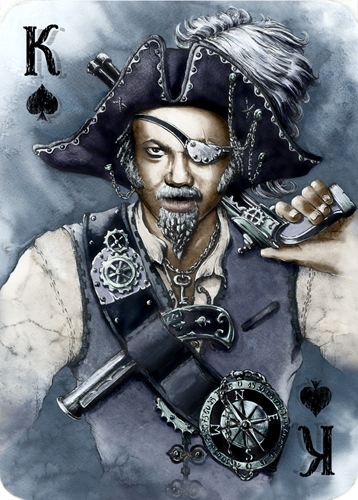 But the jack of clubs should express the scientific atmosphere even harder. That's why I designed him as a mix of a microscope, oscilloscope and... some other parts. From the 'Did you know' series: in Poland clubs are colloquially called "żołędzie" which means "acorns". That's why the jack of clubs is examining an acorn. An thái sơn chuyên cung cấp máy đưa võng uy tín cho bé với các blog như Mayduavong.me, Mayduavong.mobi, Mayduavong.ws và Mayduavong.in giúp bé yêu ngủ ngon giấc.